Thank you so much to Yellow Impressions for this Fabulous Blog Award nomination! You totally made my day. 1. Post the rules on your blog (done). 2. Name 5 of your most fabulous moments (either in real life or in the blogosphere). The day I married my awesome husband almost 37 years ago! Salvation in Jesus Christ at age 15. This is actually four fabulous moments – the births of Julie-Anne, Michael, Jordan, and Kelsey. And this is actually seven fabulous moments – the births of Emily, Caleb, Joshua, Reece, Nikolas, Elijah, and Jairus. Winning first place in a fiction contest! 3. Name 5 things you love. Being in “the zone” while writing. 4. Name 5 things you hate. Spiders and bugs of any kind. Mint in anything but gum. 5. 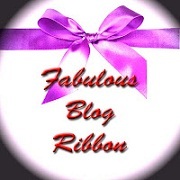 Pass the ribbon on to 5 bloggers and leave a comment notifying them of their win. You need to check out these blogs! 2) Toss the rules to the side of the road and do whatever you want with it!